Would you like to increase and/or enhance native vegetation and wildlife habitat on your property? Connecting Country works with landholders and community groups to undertake landscape restoration projects across the Mount Alexander Region, including properties on both public and private land. Typical ‘restoration’ activities that are supported include grazing regime change, revegetation and natural regeneration, protective fencing and the control of pest plants and animals. For eligible projects, Connecting Country may be able to provide technical advice, management plans, biodiversity assessments, work crews and incentive payments. Our projects are funded from a variety of sources, and generally supply eligible landholders with valuable understorey plants that will enhance existing native vegetation, and provide habitat for many small birds such as Diamond Firetails, Superb Fairy-wrens, Scarlet Robins and Brown Thornbills. Prickly plant species include Bushy Needlewood (Hakea decurrens), Tree Violet (Melicytus dentatus), Sweet Bursaria (Bursaria spinosa), and acacias such as Hedge Wattle (Acacia paradoxa) and Spreading Wattle (Acacia genistifolia). Project area size – minimum of 1 hectare (2.47 acres) of native vegetation, excluding buildings, dams, gardens, etc. 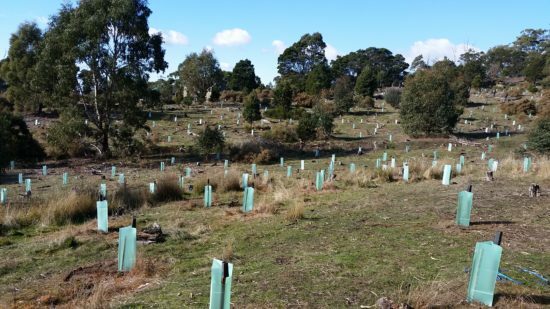 Due to a great response from the community, assistance through our current projects has currently been allocated – however we welcome all interested landholders in the Mount Alexander region (Victoria, Australia) to submit an expression-of-interest form. That way once we have your details on file, we can let you know of future assistance opportunities, as they arise. 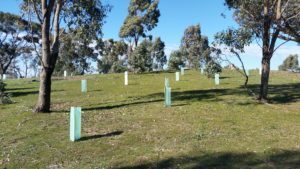 Whether you are at the beginning of your journey with learning more about looking after the bush, or managing habitat on your property, or are more experienced with managing your land for habitat, all interested landholders in the Mount Alexander region are encouraged to complete an expression of interest form. To find out more about our current projects or discuss your eligibility, call the Connecting Country office on (03) 5472 1594. If you have filled out an expression of interest form in the past 12 months, we have you on file and you don’t need to fill in another form. Simply email info@connectingcountry.org.au to let us know you are still interested and we will be in touch. Step 1. Landholders or community groups contact Connecting Country to express an interest in undertaking a project on their property. Step 2. After speaking with the landholder/group, Connecting Country conducts a desktop study of the property location to determine its eligibility for being involved in one or more of the current Connecting Country programs. Step 3. (a) If the property is eligible for direct support, Connecting Country staff visit the property to undertake a site assessment. An inventory of plant species is recorded and any areas of native vegetation are mapped. Threatening processes are identified (e.g. weeds, rabbits). Potential project areas and management options are discussed with the landholder/group. Step 3. (b) If the property is not eligible for direct support, Connecting Country will assist the landholder/group by providing technical information and contacts for other potential support. The property is also added to our database should new opportunities arise with Connecting Country in future. (No further steps for ineligible properties). Step 4. Based on the site visit and the discussions with the landholder/group about project options, Connecting Country staff prepare a draft management plan which includes the findings of the site assessment, maps, photos, a description and timeline of management activities, and a project budget. The landholder/group provide feedback on the draft plan. After further reviews, a final version of the plan is then developed, which is acceptable to the landholder/group and also meeting the Connecting Country’s program criteria. Most plans have a 10-year timeline for implementation. Only plans that are fully embraced and accepted by the landholder/group proceed to the next step. Step 5. Connecting Country staff submit the final agreed version of the plan for review and endorsement by the Connecting Country Committee of Management. Step 6. Once approved by the committee, the plan is ready for implementation. Funding documents and stewardship agreements are signed. Step 7. During the first year of the plan’s implementation, Connecting Country will provide in-kind or direct funding assistance to undertake some of the more intensive on-ground actions. On-going technical advice and support is offered by Connecting Country for the life of the management plan.